Want to Save Your Home or Vehicle? We Now Offer a No-Fee ($0) Up Front Chapter 13 Filing! If you are one of millions of Americans who has been hit with a debt avalanche caused by medical bills, student loans, losing your job or divorce, today’s blog on Chapter 13 bankruptcy is for you. This could be the opportunity you have been looking for to stop wage garnishments, save your home, vehicle and retirement accounts. Bankruptcy gets a bad rap for illogical reasons. Most people are afraid of bankruptcy because they are worried about the process, the stigma, their credit scores, or losing all of their assets. In truth, bankruptcy is for people who have something to protect. The Sader Law Firm is now offering to file your Chapter 13 case for $0 in up-front attorney fees! If you have a job and set up Chapter 13 payments with the Trustee, you will not need to pay the Kansas City bankruptcy attorneys at The Sader Law Firm any money, except required court filing fees to get your case filed. Our attorneys do not charge fees for an initial consultation. We will review your financial situation and offer you legal options at no cost. Just call the office to see if you qualify for the no up-front filing fee option. Like we said, bankruptcy is about protecting what you want to keep. Chapter 13 bankruptcy can lower monthly payments and allow you the chance to keep some of your most important assets. Reduce what you owe on your vehicle or mortgage: If you are paying too much on your vehicle or mortgage, we have good news. Through your Chapter 13 plan, it is possible to significantly reduce the amount you owe on your vehicle. We have written about the eligibility requirements for using the Chapter 13 cramdown on our blog before. If you are facing foreclosure, filing for Chapter 13 bankruptcy can, under some circumstances, strip second mortgages. Filing for bankruptcy issues an automatic stay: Do you want to keep your home or vehicle you use to get to work? Are collection agencies blowing up your phone? Keep reading. An automatic stay will temporarily stop all collection attempts, which includes foreclosure, repossession of your vehicle, wage garnishments and bothersome phone calls from collectors. Repay debts over three to five years: Chapter 13 plans will allow you to make payments on your debts over a period of three to five years. After completing your Chapter 13 plan, you should be ready to move forward with only those debts you want to keep, such as your home and car. Other debts should be discharged. You have no direct contact with creditors: Do you hate talking to your creditors? We have more good news. After filing for Chapter 13, your payments will be distributed to your creditors by the Trustee. Setting up automatic payments with your Trustee may also increase the chances you successfully complete your Chapter 13 repayment plan. 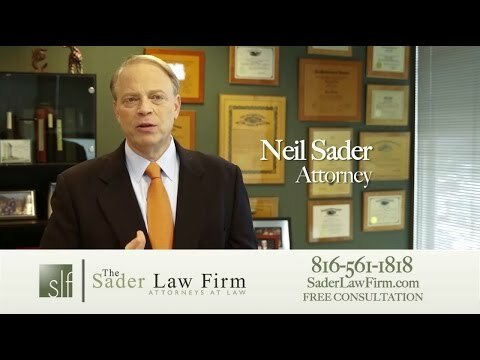 The Kansas City bankruptcy attorneys at The Sader Law Firm will work one-on-one with you to help you find the best solutions for managing your debts. *The Sader Law Firm reserves the right to charge a Fee in certain circumstances due to case complexity, emergency nature or if the case requires filing outside of the Kansas City area. The No Cash Up-Front Chapter 13 cases must utilize direct pay such as a Wage Order. Cases not utilizing direct pay or Wage Orders are subject to higher Initial Fees.